Are you considering getting a new dog? You may be wondering whether the lively St. Bernard temperament is a good fit for you. If so, then read on. Bringing a new dog into your family is a big decision. It is therefore important to find out everything you can about the breed you’re interested in so you know what you will be getting yourself into. Weighing in at as much as 180 lbs. (! ), these dogs take up a lot of room in your house and in your heart. Be warned: these dogs drool and shed. A lot. But, for a lot of people, the gentleness of the Saint Bernard’s temperament makes the dog worth the mess. Like many large breeds, these guys don’t usually live past 10 years. But the decade you spend with him will be a decade filled with king-sized love and loyalty. There is a reason that Nana, the dog in Peter Pan, is a Saint Bernard. These dogs are famous for their tolerance and gentleness with children. In fact, many people say you actually have to protect this Gentle Giant from the kids because he will put up with just about anything! The watchful St. Bernard temperament has earned him the reputation of being the perfect babysitter. But remember, it is never a good idea to leave children under the age of 6 unattended with any animal, even the kind-hearted Saint Bernard. It takes a lot of energy to lug 180 lbs around, so these dogs like to spend a lot of time lazing about while keeping an eye on things. Keep in mind though, that Saint Bernards do need exercise to stay happy and healthy. A couple of walks a day will help keep his joints and muscles sound while helping prevent any destructive behavior. The gentle Saint Bernard’s temperament might lead you to think that he is just a big, dopey dog with more brawn than brain. Like many intelligent breeds, the Saint Bernard needs obedience training so that he learns how to use his smarts for good, not evil. The last thing you want is this super-strong beast ruling the roost! The gentleness of the Saint Bernard temperament does make him easy to train, so that certainly helps. Imagine coming across 150 lbs. of protective fury as you attempt to break into a dark house! Though friendly and laid back, these dogs are very protective of their family and their territory, and they have a bark that will make even the most hardened criminal’s blood run cold. Unlike the Chihuahua, who has a similarly unnerving bark, the Saint Bernard has the muscle to follow through once he sounds the alarm. Maybe it is because they know they take up a lot more room than the average pet, or maybe because they don’t feel the need to push their weight around. Whatever the reason, the Saint Bernard’s temperament makes them very well suited to living with other dogs and pets. For the record, this goes for both male and female St. Bernards. They both have identical temperaments. The only way you can tell the difference between a male and female is the dog’s size, as the female is slightly smaller. 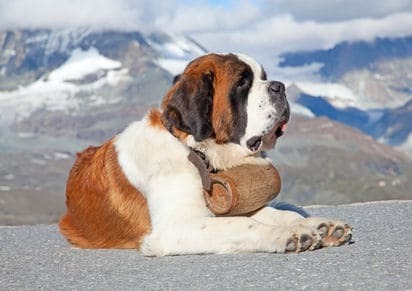 The Saint Bernard’s origin was as a search and rescue dog in the extremely frigid Alps. In fact, they got their name from the very dangerous Saint Bernard Pass where they would rescue wayward mountain climbers. Insofar as the barrel around a St. Bernard’s neck, his history tells a different story, depending on the source. Some believe he would keep whiskey or rum in the barrel to give to the climbers he saved to warm them up. Others believe it was merely an artistic choice after painters included the barrel in their depictions of St. Bernards in their paintings. Their tolerance for the cold and snow makes the St. Bernard unsuited for life in warm weather climates. St. Bernards have that deep desire to be with their family that can turn into separation anxiety if you leave him alone for too long. If you have the kind of schedule that keeps you out of the house for long periods of time, you may want to consider a different breed. And, as mentioned earlier, it is imperative that you train your St. Bernard as early as possible. With his hefty body, he could do some real damage if he jumps up on someone as an adult. If you find you can’t train him or your training methods aren’t working, then enroll him in obedience school as soon as possible. He needs training and socialization as early and as often as possible to cut down on potential temperament and behavioral problems. For help with training your Saint Bernard dog take a look at The Online Dog Trainer by Doggy Dan. Doggy Dan is an expert Dog Trainer based in New Zealand. His online resource contains Hundreds of Excellent Dog Training Videos that will take you step-by-step through the process of developing a healthy, happy well-behaved dog. There are both long-haired and short-haired St. Bernards, but no matter which kind you choose, you need to pay the same level of care to his coat. Brush him weekly to free any dead hair and dirt and to keep him looking spiffy. You will need to brush him daily during his shedding season, which occurs twice a year. Give him an occasional bath to cut down on the stink and to keep him looking fresh. And if you’re looking for a hypoallergenic dog, that would be difficult to find. The only way to tell if a dog makes you allergic is if you spend time with the one you want to bring home. Despite his huge size, which can range from 26 to 35 inches tall and up to 260 lbs. the St. Bernard does not need much in the way of exercise. This isn’t to say he’s a couch potato, but he doesn’t need to hike up large mountains every day to feel satisfied. A long daily walk or half-hour play session is enough to meet his needs, though if you’re up for a longer hike, he’ll be glad to tag along. Ultimately, a St. Bernard is happiest when he’s doing activities with his family. Like many large breeds, the Saint Bernard may be prone to Bloat and Hip Dysplasia, as well as Heart issues. If you notice any symptoms of the above in your pet, get him to a vet immediately. Also, the best way to avoid these types of problems is to get your Saint Bernard from a reputable breeder, not a pet store or puppy mill. These places tend to propagate these sorts of health issues generation after generation because they’re only in it for the money. Note: if you agree that your health and your dog's health should be a top priority then get a copy of The Ultimate Guide to Dog Health. Your St. Bernard friend will love you for it. This guide will help save you money, time and most of all help you keep your dog healthy. Have you made enough room in your house for a St. Bernard puppy? First off, that’s impressive! Second, congratulations! 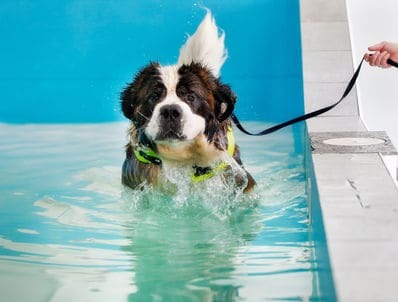 If you’re unsure of where to start, you can either research and then purchase a St. Bernard from a breeder or look for one at your local adoption agency. The average St. Bernard price can be anywhere from $350 to $4,500. It all depends on his history, his pedigree, and the price the breeder decides to charge. Of course, the price can change depending on where you go for your new family member. If you want to adopt a St. Bernard puppy, you may be able to find one at your local rescue organization. If you don’t find one right away, keep checking back, as their “stock” changes all the time. There are a number of reasons why you may prefer to adopt than buy. For one thing, at around $150 to $400 for an adoption, as opposed to thousands for a breeder’s puppy, price may be one reason why you choose to adopt instead. For another, you may be interested in a mixed breed, not just a purebred, and you’re likely to have better luck finding a mixed breed at a shelter. Not only that, but shelters train their dogs, if they’re not already trained, to make them more adoptable. So, if you have no interest in potty-training a new puppy, you may not have to worry about it at all – the shelter has you covered. Another option is to buy St. Bernard dogs for sale from a breeder. However, you must do your research before settling for the first dog who gives you puppy dog eyes. For instance, you can reference the American Kennel Club (AKC) insofar as the standard traits you should look for, including the accurate colors of purebred St. Bernard dogs. For instance, if someone is selling a St. Bernard puppy with different colors that don’t match the AKC’s list, the dog may actually be a mixed breed. The breeder may be trying to trick you into spending thousands of dollars on a dog you think is a purebred, but he’s actually a mutt. You also need to research the breeder on their websites and social media profiles. You can also review their online reputation to see if any customers have reported complaints after dealing with the breeder. Upon your visit to the breeder, you should look for signs that the breeder is not taking proper care of the dogs. You should report breeders that keep their dogs in filthy and/or cramped conditions. You should also avoid buying a St. Bernard puppy from breeders who cannot provide you with his medical records. 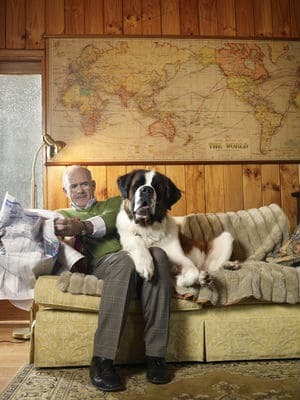 Is the St. Bernard Temperament Right for You? If you live in a warm climate or small apartment, this might not be the right dog for your family. The same goes for if you don’t want a lot of drool or dog hair flying around the house. On the other hand, if you are looking for a kind and gentle giant, then the sweet St. Bernard temperament might be the perfect match.